For a trial period (April to September 2012) Council meetings are held on the last Thursday of each month commencing at 5.30 pm AND the second Wednesday before the last Thursday of each month commencing at 8.30 am. Council meetings are held in the Council Chamber at Council's Administration Centre—44 Princess Street, Macksville. Further testing undertaken early June. All servers were brought up successfully. Most applications ran. There remains an issue with email which should be easily resolved. However the major issue is that there is still a dependency on the servers in the Administration building to prepare the back up server. A quote has been obtained from contractors CSA who supplied the back up server to rectify the problem. Draft completed and awaiting comments from Councillors before being reported back to Council. Draft policy completed. Awaiting comments from Councillors by 14 July 2012. Further work being undertaken on the policy emanating from the resolutions of Council’s meeting 2/2/12. Draft policy will now be provided to Councillors for comment at end of February. To be included in Tree Register Report in August – Item No 30 below. Sections identified on South Arm Rd and scheduled for June 2012 – due to inclement weather. South Arm Road is currently in good condition and no value in gained in undertaking the work at this present time, will wait until road deteriorates or trial various sections. Project trials transferred to Old Coast Road to take advantage of Road conditions. Change in Rates staff meant that there has not been the opportunity to review the criteria. To be reported in 2012/2013. No response as at 20 June 2012. Acknowledgement letters have been received, advising that matter is being investigated. To incorporate outstanding action No 9 above. Training organised for senior management July/August. Investigations to commence when Strategic Planner returns from leave in August. Deferred to July 2012 due to workload. Council request the Local Traffic Committee to consider a limit of 40kph for Seaview Street and Bent Street, Nambucca Heads. NB: The speed limit on Bent Street and Seaview Street Nambucca Heads meets NSW Speed Zoning Guidelines for 50 km/h urban default. Council include information on its website and in the next rate payers’ newsletter about the costs to and impacts on the environment of detergents and urging the use of lower impact environmental products. That the Flying Fox Plan of Management for Grassy Park, Bowraville be deferred for 3 months to provide affected residents with the opportunity to establish a Committee and put forward an alternative Plan of Management for Council’s consideration. Letter sent to Ms Glennon regarding resolution. River Ecohealth Project be deferred until consideration has been given to reviewing the environmental levy works program and after consideration has been given to reviewing hot spots like Newee Creek which may require further sampling. Review of Environmental Levy Works underway. Council receive a report on the application (for the exploratory mining lease) including whether Council should make representations to the Department. Further the report should cover the problem with antimony mining at Kempsey Shire and whether Council can legally advise affected property owners. That the options identified in the Operational Plan/Delivery Program to improve Council’s asset renewal rates be the subject of ongoing consultation with the community. To be included in the newsletter to go out with the rates notice. Councillors consider the draft Investment of Surplus Funds Policy and Strategy and provide any comments to the GM by 14 July 2012. Awaiting comments from Councillors by 14 July 2012. The trial meeting arrangements continue on a permanent basis subject to a review by the newly elected Council post the 8 September 2012 local government elections. Council receive a report on the opportunities for employing and/or training its own traffic controllers and also enquiring about purchasing and utilising automatic traffic signals. Report to the August Council Meeting. There has been further negotiation with the Nambucca River District Agricultural Association Inc. in relation to the potential transfer of the Showground to their ownership. Council has now received a response to its draft Deed of Agreement from the Nambucca River District Agricultural Association. In essence the Association agrees with the draft Deed with the major difference being a refusal to accept a ceiling of $200,000 on the upgrade of the wastewater management system. The upgrade of the wastewater management system has been further investigated by the Manager Business Development. He has now received a proposal from a specialist supplier of waste water treatment plants to provide an aerated system comprising 6 air stone units in 3 x 20,000 litre tanks with air supply via a 1.5kW, single phase air pump. The tanks would be provided with an automated bacteria dosing system. The effluent is treated to a standard which can be discharged to stormwater, however with additional wet weather storage capacity the treated effluent can be recycled for yard and truck wash down as well as irrigation of the showground. The evidence provided by the company indicates that the operating costs of the system would be less than the current arrangement of trucking the effluent off site. The system can be installed for less than the budget provision in Council’s Environmental Levy program. Accordingly it is proposed that Council commit to an upgrade of the wastewater management system in the Deed of Agreement. It is recommended that Council sell the Macksville Showground and execute the amended Deed of Agreement. 1 That Council sell the Macksville Showground including the Macksville Saleyards being all of the land contained in Lot 1 DP 434625, all of the land contained in Lot 1 DP 510178 and all of the land contained in Lot 2 DP 510178 to the Nambucca River District Agricultural Association Limited for $1.00. 2 That Council endorse the Deed of Agreement between Council and the Nambucca River District Agricultural Association Limited as amended in conjunction with the transfer of the land. 3 That Council’s seal be attached as required to the transfer and the Deed of Agreement. Council can retain the Macksville Showground, including the Macksville Saleyards, in its ownership or transfer ownership to the Nambucca River District Agricultural Association Limited. If Council contemplates the proposed transfer of ownership then it also has options in relation to the content of the Deed of Agreement. It will be recalled that in December 2011 Council invited an expression of interest from the Nambucca River District Agricultural Association Limited (the Association) to purchase the freehold title comprising the Macksville Showground. The Association is a company whose charter and reason for existence is the delivery of the Macksville Show and the operation of the Showgrounds. Council has delegated powers to the Association under Section 355 of the Local Government Act as a Committee of Management for the Macksville Showground. The Association submitted an expression of interest on 1 February 2012 which was subject to a number of conditions. Importantly, at that time Council was unsure of what its liability would be for any work heath and safety deficiencies at the Macksville Saleyards and also for the upgrade of its effluent management system. Since then the WorkCover Authority of NSW has undertaken a work health and safety audit of the Saleyards and, with the exception of the tiered seating beside the sales ring, has determined a general overall satisfactory result. The Council is in the process of replacing the tiered seating. Council’s Manager Business Development also negotiated the disposal of Saleyards effluent at the Wirrimbi Cold Stores (Wingham Beef Exports) wastewater treatment system. The EPA has assessed this arrangement as being a viable short to medium term solution, as long as Wingham Beef Exports are willing to accept and manage the effluent. More recently he has received a proposal for a permanent solution to the effluent management problems via a small aerated wastewater treatment system. The draft Deed of Agreement was submitted to the Association for their consideration and their response is attached. In response to their comments, the draft Deed of Agreement has been amended. The following lists their requests and the action which has been taken. The draft deed already provided for the replacement of the seating. Council is in the process of replacing the tiered seating. Plans have been prepared by a structural engineer and provided to saleyard representatives for comment. By the time of this meeting it is anticipated that a development application/construction certificate application will have been lodged with Council and that requests for quotes for its construction would have been issued. 2 The Association will accept the ten (10) year sunset clause for payment of the annual subsidy and the agreement as a whole. 3 The Mid North Coast Machinery Restoration Club’s interests have not been protected. Council’s assistance and funding to formalise such protection in a separate document is sought, if necessary. The matter has been discussed with the nominated representative of the Club. Their primary concern is that a breakdown in relations with the Association may cause them to want to relocate to another venue. If this were to happen they would want the Council to pay them the fair value of their investment on the site. Provision has been made in the Deed of Agreement to acknowledge the Club’s tenure and also their exclusive use of the Showground for the Rusty Iron Rally. A provision has also been included for the Mayor and General Manager to act as mediators in the event that there is a dispute in relation to the terms of their tenure and the exclusive use of the Showground for the Rusty Iron Rally. It is difficult to foresee a dispute which cannot be resolved as the activities of the Machinery Restoration Club and the Rusty Iron Rally are very much in the interests of all the stakeholders. 4 The Association accepts the $5,000 ceiling on use of plant provided this cap is subject to C.P.I. The deed has been amended to provide for this. 5 There are concerns with stock impounding in regard to notifiable stock disease outbreaks and the potential need for an alternate site for a holding/quarantine facility. This matter should be addressed by a separate document. This matter has been discussed with the Secretary of the Association. It is understood that depending upon the quarantine restriction they may wish to utilise a separate part of the Showground site for cattle sales. This would be a matter for the Association. Without knowing the potential nature of a quarantine incident it is difficult to draft a provision which would respond to all contingencies. Other than Council being open to provide a suitable alternative temporary site if one was available it is not clear what further assistance could be provided. A provision concerning this has not been included in the Deed of Agreement. 6. On site wastewater management system to be compliant with Environment Protection Authority standards is an integral component of the expression of interest. The Association will not accept a ceiling of $200,000 to ensure compliance. Council’s Manager Business Development has made further enquiries about a permanent solution to effluent management at the Saleyards. A specialist supplier of waste water treatment plants has provided Council with a proposal to provide an aerated system comprising 6 air stone units in 3 x 20,000 litre tanks with air supply via a 1.5kW, single phase air pump. The tanks would be provided with an automated bacteria dosing system. The effluent is treated to a standard which can be discharged to stormwater, however with additional wet weather storage capacity the treated effluent can be recycled for yard and truck wash down as well as irrigation of the showground. The evidence provided by the company indicates that the operating costs of the system would be much less than the current arrangement of trucking the effluent off site. The system is operational in many saleyards across NSW. The provision in Council’s Environmental Levy program for upgrading the saleyard’s effluent management is sufficient to enable Council to proceed with the installation of this system and accordingly the deed of agreement has been amended to provide for the upgrade of the effluent management system within two (2) years of the execution of the agreement. It is in Council’s interests to locate the sewer rising main on the site within an easement. Provision has been made in the Deed for the creation of an easement within 12 months of the execution of the agreement. 8 Council to retain ownership of the 100mm water main which services the fire hydrants. The matter has been discussed with Council’s Water and Sewerage Supervisor. There is a 100mm main on the site which has a number of metering points. Notwithstanding that the main is located on the Showground, as Council generally accepts responsibility for water mains on the supply side of the water meter there is no additional burden on Council in explicitly accepting responsibility for the 100mm main. The second version of the Deed of Agreement with the additions in underline and the deletions in strikethrough is attached. There has been consultation with the Nambucca River District Agricultural Association Limited; the Mid North Coast Machinery Restoration Club and Council’s solicitor, Terry Perkins. There are no implications for the environment in relation to the possible transfer of ownership. The upgrading of the wastewater management system at the Saleyards will be an environmental improvement. There are no social implications. The transfer of the Showground to the Association will not impact on the activities undertaken at the Macksville Showground. The ownership and liability for the Macksville Showground has passed between Council and the Nambucca River District Agricultural Association. There is a risk that if the Showground is not properly managed, and notwithstanding the proposed agreement, there may be pressure at some future time for Council to reclaim ownership. There is similarly a risk that a future Council may not have the necessary funds to maintain the Showground in a reasonable condition. In relation to the quantum of the subsidy there is a risk that it may be either excessive or insufficient. The actual average annual net cost of the Saleyards over the past 5 years has been $12,943. In relation to the cost to Council of retaining the Showground, many of the costs are not disaggregated in Council’s budget. For example the mowing of the Showground is costed to mowing in Macksville rather than the operating expense for the Showground (W1250). However enquiries with Council’s Parks Supervisor indicate that it costs about $1,060 per mow and there are about 10 mows a year. Similarly with insurance there is a single allocation for all reserves. However enquiries with Council’s Risk Officer who is responsible for insurance indicate that based on Council’s insurance schedule, the insurance premium for the Showground was $10,337 in 2012/2013 based on a building value of $2.8m. With depreciation, there is a single budget allocation for all reserves of $366,500 in 2011/2012. However of this $64,755 is attributable to the Showground. Besides the disaggregated expenses, there is a budgeted maintenance expense for the Showground in the budget. It was $4,900 in the 2011/2012 budget but Council actually spent $9,299 for the year. The expenses incurred relate mainly to waste removal and cleaning toilets 2 to 3 days per week depending upon use. The above equates to current annual operating expenses for the Showground, including the Saleyards, of $107,934. It should be noted that the above operating expenses include unfunded depreciation and overheads, so in cash terms the benefit to Council’s working funds will be much less. Allowing for the reduction in building insurance and some of the costs associated with building maintenance and mowing, the funding of the $35,000 subsidy to the Association will require some additional cash, perhaps $10,000 to $15,000 per annum. However over time Council is aware that depreciation and overheads are real costs which will impact on Council’s operations. Over the past 2 years Council has also incurred some significant non-operating expenses in relation to upgrading electrical switches ($60,000) as well as the recent rehabilitation of the internal road ($93,000). Whilst these expenses were funded from grants and Section 94 contributions there is an opportunity cost related to their application. The Deed of Agreement also proposes waiving outstanding loan repayments in relation to the property. The outstanding loans comprise an internal loan balance of $77,484 for the Saleyards as well as an outstanding loan balance of $7,186 to the Association which was for the construction of stables. Taking into account Council’s financial situation and inability to adequately fund the depreciation of its assets, the proposed Deed of Agreement and transfer of ownership of the Showground is considered to be in Council’s medium to long term interest. The impact on future budgets is discussed in the risk section. The impact on working funds is discussed in the risk section. B. On 1st February 2012 the Association wrote to the Council expressing interest in purchasing the Macksville Showground and including the Macksville Saleyards subject to a number of conditions. C. The Mayor and the General Manager of the Council met with the President and the Secretary of the Association on 15th May 2012 and agreed to put in place an agreement for the formal consideration of both the Council and the Association wherein the Council will sell the Macksville Showground and including the Macksville Saleyards to the Association for $1.00 subject to conditions. D. The Environment Protection Authority has, in a letter received by Council on 16 May 2012, advised that Council’s proposal to dispose of the Macksville Saleyards wastewater to the Wirrimbi Cold Stores (Wingham Beef Exports) wastewater treatment system is a viable short to medium term solution, for as long as Wingham Beef Exports are willing to accept and manage the effluent. However, due to the uncertainty around the longer term viability of this agreement with Wingham Beef Exports, that the Council must be committed to progressively work towards upgrading the wastewater management system at the Macksville Saleyards. E. Wingham Beef Exports has advised the Council that they will allow the disposal of the Macksville Saleyards wastewater to the Wirrimbi Cold Stores (Wingham Beef Exports) wastewater treatment system at no cost provided the Council makes available the use of the Macksville Saleyards for the yarding and transfer of livestock they may acquire from producers in the Nambucca Valley at no cost. D. The Environment Protection Authority has, in a letter received by Council on 16 May 2012, advised that Council must be committed to progressively work towards upgrading the wastewater management system at the Macksville Saleyards. E. The WorkCover Authority of NSW undertook a work health and safety audit of the Macksville Saleyards on 13 April 2012 and by letter dated 16 April 2012 advised the Council that the audit determined a general overall satisfactory result but required that the tiered seating adjacent to the sales ring comply with Australian Standards. 1. The Council will sell the Macksville Showground and including the Macksville Saleyards being all of the land contained in Lot 1 DP 434625, all of the land contained in Lot 1 DP 510178 and all of the land contained in Lot 2 DP 510178 to the Association for $1.00. 2. The Council will pay all legal costs incurred by both the Council and the Association on the transfer of the land including stamp duty. 3. The Council will make an annual payment to the Association of $35,000 if the Macksville Saleyards are operational and $45,000 if the Macksville Saleyards are not operational, for a period of ten (10) years. At the expiration of the ten (10) year period the Council shall consider, but shall not be obliged to, extending the subsidy at this agreed amount or some other agreed amount. For the purposes of this clause, the Macksville Saleyards shall be deemed operational if there is a public auction of livestock on at least six (6) separate occasions over any 12 month period. 4. The annual payment referred to in Clause 3 shall be indexed annually in accordance with movements in the Consumer Price Index. 5. The Association warrants that it will allow Wingham Beef Exports to use the Macksville Saleyards for the yarding and transfer of livestock they may acquire from producers in the Nambucca Valley at no cost whilst ever Wingham Beef Exports continue to agree to receive and dispose of effluent from the Macksville Saleyards at the Wirrimbi Cold Stores (Wingham Beef Exports) wastewater treatment system at no cost. 6. The Council warrants that it will pay any licence fee which may be required by the Environment Protection Authority or their successor as a regulatory authority for the disposal of effluent from the Macksville Saleyards at the Wirrimbi Cold Stores (Wingham Beef Exports) wastewater treatment system. 7. The Council warrants to pay all capital costs which may be incurred as a result of any order from the Environment Protection Authority or their successor as a regulatory authority in relation to the upgrade of the wastewater management system at the Macksville Saleyards up to a maximum of $200,000 in 2012 Australian dollars for a maximum period of ten (10) years. 8. The warranty referred to in Clause 7 shall be indexed annually in accordance with movements in the Consumer Price Index. The warranty does not extend to additional operating costs. 5. The Council warrants that it will upgrade the wastewater management system at the Macksville Saleyards to meet the requirements of the Environment Protection Authority within twenty four (24) months of the execution of this agreement. The design and implementation of the wastewater management system will be undertaken in consultation with the Association. 6. The Council warrants it will install tiered seating adjoining the sales ring at the Macksville Saleyards which is compliant with Australian Standards either before or within two (2) months of the execution of this agreement. 7. The Council warrants that it will continue to use the Macksville Saleyards as its stock impounding facility and will pay the Association for such use in accordance with the Association’s fees and charges whilst ever the Macksville Saleyards are operational or for a period of ten (10) years, whichever occurs first. 8. The Council warrants that it shall provide the Association with a Traffic Management Plan for the Macksville Showground including the Macksville Saleyards and the Council shall undertake all work required by the Traffic Management Plan except that the Council shall not be required to provide labour to control or direct traffic. 9. The Council warrants that it shall continue to allow its employees, acting as volunteers for the Association and in their own time, to utilise Council plant to attend to work required at the Macksville Showground and Macksville Saleyards. Council warrants that it will make plant available at no cost to the Association provided it is not required for Council work and up to a capped value of $5,000 per annum based on Council’s internal plant hire rates. The $5,000 per annum cap is to be increased by the Consumer Price Index for the life of this agreement. 10. The Council warrants that its Grants Officer will continue to assist the Association in identifying and applying for grants to financially assist the Macksville Showground and/or Macksville Saleyards. 11. Upon the execution of this agreement, the Council will provide to the Association all relevant documentation concerning the operation of the Macksville Saleyards including, but not limited to all work, health and safety systems, the saleyards licence, the saleyards operators association membership details, weighbridge agreement, and any lease or licence agreements. 12. The Council warrants that there is no contamination on the site and will attend to any order issued by a regulatory authority to remove or ameliorate contamination. 13. The Council warrants that it will continue to undertake the inspection of amusement devices at the annual Macksville Show. 14. The Council warrants that upon execution of this agreement that the Association shall be entitled to retain any funds it may have in its control as a consequence of it acting as the Macksville Showground Committee of Management, being a Section 355 Committee of Management under the NSW Local Government Act 1993. 15. The Council warrants that upon execution of this agreement it shall waive any and all outstanding loan repayments which may exist between the Council and the Association or between the Council and the Macksville Showground Committee of Management. This includes any outstanding loan repayments for horse stables. 16. The Association warrants that it will allow the Mid North Coast Machinery Restoration Club Inc. to remain as an occupant of the Macksville Showground and also provide them with exclusive use of the Macksville Showground for the Rusty Iron Rally. The terms of the occupation and use of the Showground are to be as agreed between the parties. In the event that no agreement can be reached, the Council warrants that the Mayor and General Manager will volunteer to act as mediators. 17. The Association warrants that it will allow Nambucca Shire Council to register an easement over the rising sewer line on the Showground at no cost to Council and the Council warrants that it will create the easement within 12 months of the execution of this agreement at no cost to the Association. 18. Council warrants that it will accept responsibility for the 100mm water main located on the Showground. 19. The period of this agreement is 10 (ten) years. § Proposed building 3 times larger than buildings already in the park. 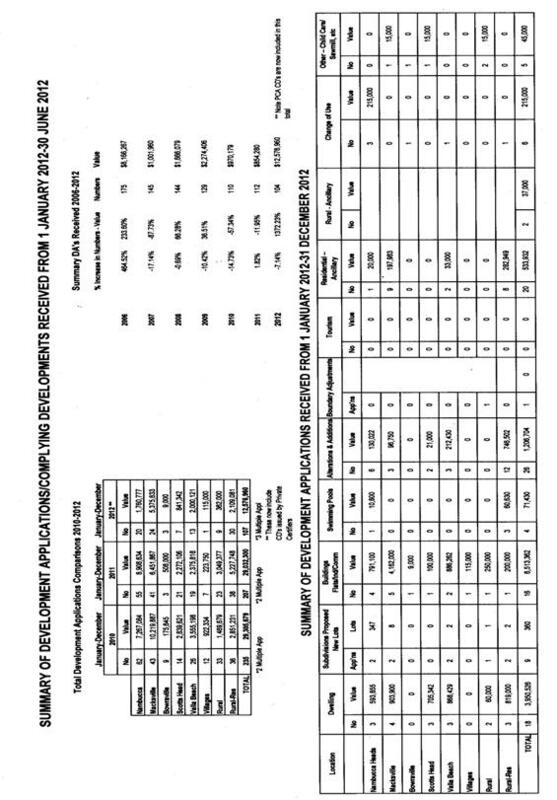 Environment and Planning Department Development Application statistics for the calendar year 2012 compared with 2011 and Certificate Applications/Drainage Diagrams/Outstanding Notice Applications received and determined are provided in the body of the report. The figures show a -7.69% decrease in the number of DA’s received to June 2012 with construction costs decreasing by -51.54% compared to the same period in 2011. The total number of DA’s/CD’s approved for the month of June was 16 plus 1 modification. ** The clock was not “stopped” on this application as Council was waiting for referrals from the RTA. This short report is to advise Council that Nambucca Shire now has its own library service and is fully independent of Clarence Regional Library. The new library service commenced on Monday 2 July 2012 following successful separation of the Clarence Regional Library (CRL) catalogue and collection. That Council note the successful separation from Clarence Regional Library and the commencement of Nambucca Shire Library service. No options are required as the report is for information, however Council may wish to make additional resolutions. Following Council’s decision in November 2011 to establish its own library service, Council staff have managed to complete this in a little over 6 months. Nambucca Shire Council is now operating an autonomous library service. For Council’s information, some key points of interest follow. 1 The physical separation of the collection is completed, including a share of the stack collection held at Headquarters in Grafton. Nambucca Heads branch houses 20,298 items and Macksville 15,460. There are still many items in storage (estimated at around 3,000) which can now be processed and included in the Nambucca Shire collection. It is expected that over the coming months, books from CRL and NSC will be returned at each other’s branches, however these will gradually be returned to their correct location. 2 Council’s website has been updated and the Library Catalogue is easily reached from the Library Page. Additional information, access to databases and web-links will be progressively added. 3 The separation of Nambucca Shire from Clarence Valley and Bellingen Shire library members appears to have been completed successfully. People joining Nambucca Shire Library from 2 July will be issued with a new NSC membership card whilst existing members can continue to use their old CRL membership cards with these being replaced/updated over time. 4 Fees and Charges for library services are included in the 2012-2013 Revenue Policy. 5 Council is advised that in regard to the reserve held by Clarence Valley Council for library services, an amount of $70,000 has been paid to Nambucca Shire Council. 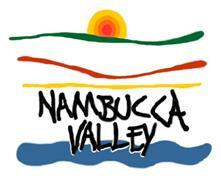 Advice is being sought on the extent of liabilities which Nambucca Shire Council has, and over the coming weeks any final payments will be discussed and negotiated with Clarence Valley Council. There are numerous positive social outcomes which can result from an efficient and effectively run library service. It is expected that 2012-2013 will be very much a year of transition. Council’s staff will be proactively managing the library budget to maximise the funds available to develop the collection, whilst keeping costs in check. Amendment 9, Nambucca Local Environmental Plan 2010 - Valla Urban Growth Area Planning Proposal has been approved by the Minister. That Council note the gazettal of Amendment 9, Nambucca Local Environmental Plan 2010 - Valla Urban Growth Area. The Minister for Planning and Infrastructure has approved the rezoning for Stage 1 of the Valla Urban Growth Area. The 280ha area just north of Nambucca Heads and west of the Pacific Highway around the location of the new Nambucca Heads Pacific Highway interchange, is the first major “Greenfields” rezoning seen in the Nambucca Shire for over 20 years. Within the 280ha, 71ha has been identified for Industrial, Warehousing, Commercial and Retail use estimated to provide for up to 250,000m2 in new floor space and approximately 750-1,250 new jobs, 74ha for Residential which will provide for approximately 800 new dwellings and a population of approximately 1,900 people, 17ha for Environmental Living along the higher elevated sections of the site for larger lots and eco tourism all of which will have great scenic views, 74ha of Environmental Management land has been set aside to ensure good management and protection of the heavily vegetated areas, steep slopes and along the water courses, and 52ha will be retained with its current Rural zone which will be further reviewed once the new Highway and Interchange is constructed. As the rezoning is identified as Valla Urban Release Area, Clause 6 of Council’s LEP 2010 applies which will require the preparation of very detailed Development Control and Contribution Plans, as will discussions with the many state agencies who will be involved in the provision of state infrastructure and the identification of land for future public needs. The landuse table for the new E4 Environmental Living Zone is outlined below. No environmental impact associated with this report for information. No social impact associated with this report for information. No economic impact associated with this report for information. There are no risks associated with this report for information. This application was lodged in 2010 and initial consultation with the New South Wales Rural Fire Service (NSW RFS) identified their requirement for an Asset Protection Zone (APZ) around the proposed new building. Furthermore, due to the close proximity with the boundary, it was not possible to provide the required APZ within the site boundary and so a land acquisition had to take place to grant an Easement on adjoining land. Before this easement could be consented to, ownership of the adjacent land had to be clarified. This ownership dispute has now been resolved, the appropriate Legal Agreement for an Easement has now been completed and NSW RFS’s have given their concurrence to the development, as their required APZ can be provided. That Council grant consent to DA 2010/221 as per the draft conditions attached to this report. Option 2 is that council could consent to the development and include additional conditions and/or remove draft condition (s) as they feel appropriate. Option 3 is that Council could refuse the development, and state under which part of the assessment criteria under Section 79 of the Environmental and Planning Act. The proposal is for an extension of an existing pre school, to provide an additional play room and additional space for other amenities i.e. staff space, laundry and toilets. The new building will be attached to the existing pre school building and within the footprint of the pre school complex as a whole, which includes the main building, various outdoor play areas and soft landscaping. The proposed location for the new building, being adjacent to the existing building, was chosen as the most suitable for the operation of the pre school to remain as efficient as possible with the increase in child numbers. The development application is classified as Integrated Development under Section 91 of the Environment and Planning Assessment Act and the Rural Fires Act 1997. Due to the position of the existing pre school building along the rear boundary, the proposed extension will also be adjacent to the rear boundary, which abuts vegetated land identified as bush fire hazard and the application site identified as bush fire prone. A bush fire Assessment Report was included as part of the original Development Application, however, New South Wales Rural Fire Service (NSW RFS) rejected this report as it worked on an assumption that an Easement could be provided in-between the new building and the bushfire hazard to the south, which meant creating such an easement on adjacent land, and not within the leased area of the pre school. This easement was vital to providing an adequate APZ to the new building. NSW RFS advised they would not issue a Safety authority Certificate or their concurrence to the development, until this matter could be resolved and that they required evidence the easement has the adjoining owners support before they would assess the proposal further. The applicant then had to try and obtain a legal agreement from the adjacent land owner that they grant an easement to the benefit of their pre school site, which bore long term complications, as the land related to a deceased estate and there was various disputes over the land transfer between Directors of the VPR Developments, prior to one of the Directors passing away. Council was not in a position to approve the development application subject to the easement on the adjoining land, until the ownership issue could be resolved, and the NSW RFS could be satisfied to give their concurrence, as the development is Integrated Development. During this process other options were considered including moving the new building. Previous Manager of Planning and Assessment, Arthur Tsembis also tried to obtain a preliminary ‘in principle’ approval from NSW RFS, unfortunately to no avail. Ownership of the adjacent land was resolved and the owner subsequently confirmed approval of the easement to benefit the pre school site. At a Council Meeting on 21 April 2011 council resolved under resolution number 2775/11 to accept the Grant of Easement to create the APZ on Lot 3 in DP 512170 to the benefit of Lot 8 DP 821952. The resolution included an instruction for the applicant to prepare a Deed of Agreement for Council to enter into, at the applicants cost. Following these resolutions Council has contacted NSW RFS for their concurrence, as Council could still not approve the development application without the concurrence without appealing to the Minister and/or Commissioner. While waiting for concurrence from NSW RFS further delays were experienced during the transfer of the title of the adjoining land and further extensions of time were requested by the applicant. The land ownership dispute has now finally been resolved and an Easement agreed to, as per a License Agreement which was signed by Council on 26 June 2012. Condition 12 of the draft consent, as detailed below, requires the easement to be registered as per the License Agreement and evidence to be provided of registration prior to issue of an Occupation Certificate. A final response from NSW RFS was given by email on 25 May 2012 to confirm their concurrence and Council can now Consent to the development, subject to the conditions provided in their Safety Authority Certificate, and as detailed in condition 1 of the draft conditions attached to this report. The Bushfire risk Management report which was provided and submitted as part of the original development application was not accepted by the NSW RFS as it included the provision of an easement on adjoining land to provide the required APZ to the new building. NSW RFS would not give their concurrence to the development until land ownership of the adjoining land had been resolved and the owner confirmed their acceptance to grant the easement. This has now been resolved and NSW RFS issued a Safety Authority Certificate, from which the various requirements are included in the draft conditions attached to this report. Manager of Health and Building raises concerns over the capability of the existing OSSMS with the increased loading caused by the increase number of children – and potentially staff – by the extension. Condition 11 has been provided in the draft conditions to ensure the appropriate investigates are undertaken to ensure adequacy of the existing system, or upgrading is provided. This site is Zoned R1 – General Residential. The application was notified and advertised and no submissions were received in response. The proposal relates to an existing and well established Pre School serving the community of Valla Beach and wider surrounding locality. The site comprises the main pre school building, various ancillary outdoor play areas, a bitumen sealed car park and soft landscaping through out. The existing Pre school already has an existing bitumen sealed access and car park to serve the development. The proposal relates to minor extensions to an existing Pre School. The community facility is well established and successful and this development if proposed to facilitate its expansion which is a direct consequence of the growing population in the locality. Due to the new building being provided to be accommodate an increase in children attending the pre school, some increase in vehicle traffic is to be expected, however, it is not expected to cause a negative impact on the surrounding locality as the pre school has an existing car park and access. The site already supports the existing use, to what this proposed development is an addition which compliments the existing use. The site is therefore capable of supporting the development. The application was notified and no submission were received. Although no public submissions were received to object to nor support the proposal, it is considered that this pre school is a valuable community facility and the proposed extension is in response to the growing number of children who could benefit from the facility in the locality. Removal of vegetation will be required to clear the areas for an APZ. However, Council’s GIS mapping show no significant vegetation need to be removed with no endangered or vulnerable flora or fauna present at this location. Vegetation to be removed will be largely Blackbutt and Wattle. The expansion of the pre school will allow more local children to enjoy the pre school facility and helps build relationships among the young families in the local community. The expansion of local businesses should be supported and will have a catalyst effect on other businesses in the area. Council has had to hold determination of the development application while an ownership dispute has been resolved on the adjacent land to grant the applicant an easement to provide their APZ. They could have refused the application as the applicant refused to withdraw it. By allowing it to pending for this long, the applicant and Council risked a deemed refusal. No risk now exists. a A 60 metre asset protection zone (APZ) is to be provided from the south eastern to south western elevation of the existing and proposed building. This APZ which shall be maintained as an inner protection area (IPA) as outlined within Appendices 2 & 5 of ‘Planning for Bush Fire Protection 2006’. Where the APZ can not be achieved on site an easement is required. b A 42 metre asset protect zone (APZ) is to be provided from the western elevation of the existing building. This APZ shall be maintained as an inner protection zone (IPA) as outlined within Appendices 2 & 5 of ‘Planning for Bush fire Protection 2006’. c A 20 metre or to the property boundary where insufficient asset protect zone is to be provided from the northern and eastern elevations of the existing and proposed building (IPA) as outlined within Appendices 2 & 5 of ‘Planning for Bush fire Protection 2006’. d Water, electricity and gas are to comply with section 4.1.3 and 4.2.7 of ‘Planning for Bush Fire Protection 2006’. e Arrangements for emergency and evacuation are to comply with section 4.2.7 of ‘Planning for Bush fire Protection 2006’. f New construction shall comply with section 6 (BAL 19) Australian standard AS3959-2009 ‘Construction of buildings in bush fire prone areas’ and section A3.7 Addendum Appendix 3 of ‘Planning for Bush Fire Protection’. g The existing building is required to be upgraded to improve ember protection. This is to be achieved by enclosing all openings (excluding roof tile spaces) or covering openings with a non-corrosive metal screen mesh with a maximum aperture size of 2mm. where applicable, this includes any sub floor areas, vents, weepholes and eaves. External doors are to be fitted with draft excluders. h All windows on the existing building are to be screened with a stainless steel mesh with a maximum aperture size of 2mm. Screens shall be placed over the entire window to prevent the entry of embers entire window to reduce the impact of radiant heat upon the glass. 2 The development is to be implemented generally in accordance with the plans and supporting documents endorsed with the Council stamp, dated *** and authorised signature, and set out in the following table except where modified by any conditions of this consent. 3 All building work must be carried out in accordance with the requirements of the Building Code of Australia as in force on the date the application for the relevant construction certificate or complying development certificate was made. 4 The application for a Construction Certificate is to include plans and specifications that indicate access and facilities for persons with access disabilities to and within the development in accordance with AS 1428.1 - Design for Access and Mobility and Part D3 of the Building Code of Australia. 5 An approval under Section 68 of the Local Government Act 1993 to carry out water supply work and sewerage work must be obtained. The effluent system servicing the pre-school facility and public hall is a septic tank connected to a collection/pump well which is believed to be discharged into Council’s sewer via the Valla Beach Tavern. Ownership and upgrading of this system needs to be considered and further advice should be obtained from Council’s Manager of Water and Sewer. 6 Stormwater drainage is to be designed to direct all water to a Council approved drainage system to prevent discharge runoff onto adjoining land. The drainage system is to be designed for 1 in 20 year storm event. On-site stormwater detention is required, restricting stormwater discharge to the pre-development runoff rate, for a 1 in 5 year storm event. This system must be designed in accordance with AS/NZS 3500.3:2003 - Plumbing and drainage, Part 3: Stormwater drainage. All piped drainage lines over adjoining land are to be located within drainage easements. All costs are the responsibility of the proponent. An approval is to be obtained under Section 68 of the Local Government Act 1993 to carry out stormwater drainage work. Engineering plans and specifications are to be submitted in triplicate and must include details in accordance with Appendix C of AS/NZS 3500.3:2003 - Plumbing and drainage, Part 3: Stormwater drainage. 7 A Long Service Levy must be paid to the Long Service Payments Corporation. This amount payable is currently based on 0.35% of the cost of the work. This is a State Government Levy and is subject to change.These payments may be made at Council’s Administration Office. Cheques are to be made payable Council. 8 All Plumbing, Water Supply and Sewerage Works are to be installed and operated in accordance with the Local Government Act 1993, the NSW Code of Practice for Plumbing and Drainage and AS/NZS 3500 Parts 0-5, the approved plans (any notations on those plans) and the approved specifications. 10 Toilet facilities are to be provided, at or in the vicinity of the work site at the rate of one toilet for every 20 persons or part of 20 persons employed at the site. Each toilet provided must be a standard flushing toilet connected to a public sewer. c No construction work can take place on Sundays or Public holidays. 13 All builders rubbish is to be contained on site in a ‘Builders Skips’ or an enclosure. Building materials are to be delivered directly onto the property. Footpaths, road reserves and public reserves are to be maintained clear of rubbish, building materials and all other items. 15 Sediment and erosion control measures must be maintained at all times until the site has been stabilised by permanent vegetation cover or hard surface. 16 A report needs to be prepared, by a suitably qualified person, to evident the existing effluent system is capable of supporting the extension and subsequent increase in effluent quantity. If such investigations find the system to require upgrade and/or replacing, then the appropriate upgrading works and/or replacement with a appropriate sized system must be provided prior to the occupation of the new building. 17 Evidence must be provided to Council that the easement has been registered, as per the License Agreement signed by council on 26 June 2012, and prior to Occupation of the building. 18 Survey certificates, from a registered surveyor, are to be submitted to the Principal Certifying Authority upon completion of the building. The Ferry Street amenities building were destroyed in a truck accident in August 2011. This report provided information on a proposal to replace the building recommends an alternative site and seeks authorisation for funding the reconstruction. 1 That Council endorse the location of the replacement amenities building at a site to the north west of the original building (referred to as Option C in this report). 2 That Council authorise the allocation of an additional $40,000 from Section 94 funds toward the cost of reconstruction of the amenities block. Council may accept a proposal from the Nambucca Valley River Users Group to carry out the construction of the replacement building. This option could see cost savings in the order of $20,000 dependant on final project design. In August 2011 a traffic accident involving a truck that left the Pacific Highway on the northern approaches to Macksville severely damaged the amenities building located in the reserve area adjacent to Ferry Street. The Damage to the building’s structure was sufficient to necessitate the total demolition of the building. A claim for damages was made against the transport company and their insurers. That claim included an amount of $113,450 as an estimate of the cost for reconstruction of the amenities block. That estimate was based on recent valuations of equivalent amenities buildings. Negotiations between Council and the insurers resulted in a final settlement of $60,000 for building replacement. This lesser amount offered reflects the cost of the ‘loss’, being the written down value of the building, as opposed to the claim being for the ‘replacement’ cost. Three options were considered being the site of the old building or sites more central to the car parking and beach areas. The attached diagram (at the end of this report) shows three options which were considered. Option A is the site of the old building. The obvious issue with this site is the risk of a similar accident reoccurring and damaging the new building or injuring an occupant of the building. Whilst it could be argued from a quantitative risk assessment perspective that the risk of a similar accident reoccurring is low in reality choosing to relocate the building at this site is not considered to be acceptable politically or socially. The fact that there have been two further incidents of trucks leaving the highway in this area since August 2011 (although neither of these accidents would have impacted the amenities building) highlights the perceived risk of this location. Option B is to site the building in a more central location to the car parks, river access and beach areas. This option is not considered feasible on two counts. Firstly, access to the sewer infrastructure on the northern side of Ferry Street would require a pumped system which would increase the cost of reconstruction and also require ongoing maintenance. Secondly, this area is subject to flooding which could potentially impact on the building and also cause problems with inundation of the sewer system. Option C is the recommended option. Whilst it cannot be guaranteed that reoccurrence of a similar accident can be avoided, this site locates the building away from the likely route of wayward traffic from the highway. This site has practical advantages in terms of access to services and is above likely flood levels. A disadvantage of this site raised by the Nambucca Valley River Users Group is the potential negative impact on the view of the river from the Pacific Highway and Ferry Street. This concern is noted but it is felt that with suitable design and possibly screening plants the advantages of this site outweigh the disadvantages. · Aligning the building such that the access doors face the park rather than away from it as was previously the case. · Provision of disabled access. · Provision of an external wash basin and shower. · Construction materials and building design. In general, the intention is to adopt a minimum standard of at least two unisex stalls, one with disabled access for construction of new or replacement amenities buildings. Use of heavy duty, vandal proof fittings is also considered an essential design criterion. Construction can be either the traditional method of a design and construct project or by utilising the increasing range of prefabricated restrooms now available. As an indication of the likely cost, the recently construction amenities at Anderson Park in Valla Beach are of the prefabricated type and cost $80,000. Recent valuations of a similar amenities building in the Shire proposed a reconstruction of $113,000. Discussions with other local Councils regarding their costs for recent amenities building show costs can be up to $150,000. A decision on the final design and construction for the building is yet to be finalised, however, preliminary estimates indicate that either of the methods mentioned above would provide a suitable building for a cost of $100,000. This is sufficient to provide a building similar to Anderson Park but with heavier duty fittings and a more aesthetically pleasing design or to carry out a design and construction project. 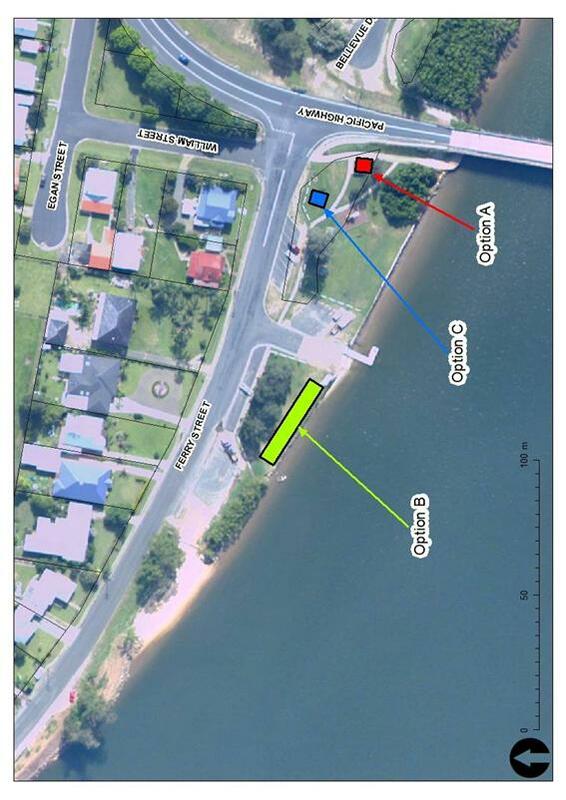 A further option to be considered is a proposal from the Nambucca Valley River Users Group to carry out the construction of the replacement building. This option could see cost savings in the order of $20,000 dependant on final project design. Given the history of this site the risk of damage to property and people from a traffic accident is credible. Changing the location of the amenities building to the proposed site is a tangible means to reduce the risk exposure. The direct impact of the current 2011/2012 budget is an income of $60,000. The allocation of $40,000 is proposed to come from Section 94 funds. There is no impact on working funds. The cost of the building will be met from the insurance payout and Council’s Section 94 reserve for open space and community facilities. “That the matter be deferred to the first meeting in July (11 July 2012). Tenders for the construction of the Nambucca District Water Supply – Bowraville Off-River Storage and Associated Works closed on 24 April 2012. Tenders were received from each of the four pre-selected tenderers and were assessed by a Tender Evaluation Panel. Following a review by the NSW Public Works to determine compliance with the tender documentation a Tender Evaluation Report was prepared taking into account any price adjustments required to reconcile the qualifications and departures identified in the original tender. The Tender Evaluation report was approved by an independent Public Works Tender Evaluation Review Panel and recommended that the contract be awarded as recommended in the Confidential Report (circulated with previous Council Agenda). Council has secured funds of $10M from the Federal Government and 39.8% from the State Government for the Council costs for the project. Council Resolution 3323/11 on 15 December 2011 agreed to the calling of tenders. 1 That Council accept the tenders received for all documented works required to complete the Bowraville Off-River Storage and Associated Works and award the contract to Haslin Constructions Pty Ltd for Package A and Ledonne Constructions Pty Ltd for Package B. 2 That Council delegate authority to the Mayor and General Manager to sign Tender documents and issue the Letters of Awards. 3 That Council delegate authority to the Mayor and General Manager to approve variations provided they do not collectively exceed the provision for contingencies. 4 That all approved variations be reported to Council at least quarterly. 5 That a program of free Dam Tours be undertaken to enable interested residents to inspect and be briefed on the progress of this major infrastructure project. 6 That The Mayor and the Council will still seek to have the Country Towns Water and Sewerage Program subsidy determined from the total cost of the project, not the cost minus the grant from the Federal Government. No alternate option is suggested. Following an Expression of Interest (EOI) four (4) contractors were invited to participate in an Early Tenderer Involvement (ETI) process and become prospective tenderers for the construction contract. · Haslin Constructions Pty Ltd.
Each of theses companies were invited to tender for the contract. o Upgrade access road to the storage site. Following a review of the qualifications and departures by GHD a Tender Evaluation report was prepared considering and adjusted tender prices for the two lowest tenderers. The Tender Evaluation Report has been approved by the Public Works internal Tender Evaluation Review Panel and a confidential copy of the report was circulated with the previous Council Agenda, for Council’s information. · Ledonne Constructions Pty Ltd for Package B. These were considered the best value tenders received. A risk register has also been compiled in order to quantify the likely extent of contingencies and variations that may arise during the course of the contract construction period. The assessed construction component of the risk has a quantified dollar value as contained in the confidential risk register. In recognition of the fact that variations to accepted tender amount will occur it is recommended that Council delegate authority to the Mayor and General Manager to approve variations provided they do not collectively exceed the provision for contingencies. A confidential copy of the risk register was circulated previously for Council’s information. The Nambucca District Water Supply Steering Committee meets on a monthly basis to discuss the Bowraville Off-River Storage Project in terms of progress, risks, budget and consultant engagements. 1 Dam Safety Committee approval has been obtained. 2 Licences and approvals from the Office of Water for the operation of the dam are expected in June 2012. 3 Clearing of the catchment by Forests NSW will be completed in August 2012. 4 Transfer of the ownership of the catchment from Forests NSW is expected to be completed by July 2012. 5 Land negotiations for construction activities have been concluded with all landholders signing Construction Agreements. 6 A Draft Funding Deed has bee prepared for the remaining Federal Government grant of $9M and is awaiting Ministerial approval. 7 Stage 2 Approval from the Minister has been received for 39.8% subsidy. To date Council have invested $5.734M in the BORS project, funded from reserves and a Federal Government grant of $1M. The Federal Government has confirmed the approval of a $10 million grant with $1 million being allocated to the detailed design and procurement phase of the project. Conditions have been imposed on the release of the remaining $9 million for the Construction phase including the need to secure the State funding. A Funding Deed has been agreed with the conditions and progress payment conditions with most of the funding allocated in the 2012/13 budget. The Office of Water Stage 2 offer was calculated on the actual total project cost to Council taking into account the $10M grant from the Federal Government (total project cost less $10M). Therefore the revised Stage 2 funding offer was for 39.8% subsidy of the eligible components of the estimated $35.995M. A Stage 3 application with the actual Tendered process will be submitted to the Minister. The Mayor and the Council will still seek to have the Country Towns Water and Sewerage Program subsidy determined from the total cost of the project, not the cost minus the grant from the Federal Government. There is about $4m at stake which is a considerable amount of money. As the off river storage and associated work is the largest civil infrastructure project ever undertaken by Nambucca Shire Council, there should be on-going engagement with residents throughout its construction. The residents are making the major contribution to its construction and should have the opportunity to see how their rates and charges are being spent. There should be a program of free “Dam Tours” to enable interested residents to inspect and be briefed on this major infrastructure project. The project aims to provide a social benefit through security of water supply. There is more discussion about social implications in the economic section. Dam Tours will be offered as a means of engaging with the public in relation to what we do. Experience with other dams in the region is that many people are fascinated with the engineering considerations in dam construction and major infrastructure generally. This could then encourage more community engagement. The tours would generally be on a weekend, be conducted by bus and would be dependent on the contractor's work health and safety obligations. There would be a presentation by a Council officer and the number of tours would be dictated by demand. The environment impacts of the project have been detailed in the Environmental Impact Statement that has been accepted by Council and amended at the Council Resolution 3338/12 on 11 April 2012. The tender documentation has been completed in Compliance with the EIS. Licences and approvals from the NSW Office of Water for the operation of the dam are expected in June 2012. There have been recent discussions with the NSW Office of Water and NSW DPI (Fisheries) over the draft conditions. An Aboriginal Liaison Committee ALC meeting was held on 22 May 2012 and the minutes of the meeting have been distributed. There was support for the project from the meeting. The Agreement with Forests NSW is in place and transfer of the ownership of the catchment from Forests NSW is expected to be completed by July 2012. Clearing of the catchment by Forests NSW will be completed in August 2012. A draft Adaptive Management Strategy has been developed and is planned to be implemented by Council in mid 2012. The project will have a significant economic impact on the community as increases in both the typical residential bill and developer charges have already been implemented. Equally, if Council does not construct the off river storage it will not have a reasonably secure water supply and will have to consider some form of moratorium on new urban development. Any moratorium will have a significant affect on direct investment as well as investor confidence. With a current unemployment rate of approximately 10%, any loss of investment and investor confidence would be extremely damaging to the economic and social fabric of the Nambucca Valley. The initial Federal grant of $1M has been expended on detailed design and preconstruction activities. The remaining $9M grant timing and conditions is subject to the Funding Deed to be signed off by the minister. As with any major infrastructure project there are significant risks in proceeding or with doing nothing. These risks have been the subject of on-going review by NSW Public Works and also by Council. The following is a summary of the more obvious risks. There are mitigation measures in relation to the risks identified with the project proceeding. If the project were not to proceed then detailed work would be required to try and mitigate the risks described. 1 Poor Water Quality – the potential for blue-green algae growth during warm weather as well as inorganic complexes resulting from stratification. 2 Financial – the assumptions in the IWCM business plan prove significantly different to what actually occurs. The assumptions relate to a host of variables including interest rates, population growth, the timing of new infrastructure, interest on investments, operating costs etc. 3 Construction – there are risks in the construction relating to the design, site conditions, the preferred contractor. Post construction there are risks in relation to a failure of the dam and operating arrangements. 1 Moratorium on new urban development – there is now a large body of evidence which indicates that the level of water security for the existing population is below the best practice standard level of drought security normally adopted by NSW country town water supply schemes. Council’s own drought management plan suggests there are potentially only 32 days available between going from 5 restrictions to level 6 restrictions where water for commercial and industry use would be banned and they would be effectively shut down. If Council were to continue to approve new urban development, there would be a very high risk of legal action in relation to financial losses incurred in a drought as a consequence of water restrictions. 2 Loss of grant funding – Council has achieved a funding outcome where more than 50% of the construction budget is to be met by grants from the State and Federal Governments. This is a very good outcome. If the project were to be shelved but revisited some years into the future it is unlikely that the same level of external funding would be achieved. 3 Under section 1.2 of the Department of Local Government Tendering Guidelines - Standards of Behaviour and Ethical Principles "Council must not invite or submit tenders without a firm intention and capacity to proceed with a contract, including having funds available". As the tenders have come in on budget, the State Government through the Office of Water may have concerns about Council’s governance if a tender is not accepted. This risk is enhanced by the current investigations into the structural reform of local government in NSW. The adopted tender process involving both EOI and ECI is considered to have reduced Council’s risk by engaging a contractor that has a proven capability of producing a quality job in a safe, timely and cost effective manner. OoW have advised that this project will be subsidised as part of the existing Country Towns Water Supply and Sewerage program. A Stage 3 application for funding will be made to OoW based on the accepted tender price and the reply should provide final confirmation of the amount of subsidy Council will receive. Council has committed funding to complete the construction phase of the off river storage project in the 2012/13 budget. Forward planning budgets also include allocations for the construction of the project. Council have expended $5.734M to date on this current project. Funding for the project will be sourced from reserves and loans. The Office of Water has provided written confirmation that this project is eligible for subsidy as part of the existing Country Towns Water Supply and Sewerage program. The Federal Government has confirmed the approval of a $10 million grant with $1 million being allocated to the detailed design and procurement phase of the project. Conditions have been imposed on the release of the remaining $9 million for the Construction phase including the need to secure the State funding.